Welcome to the Palace Hotel, a Luxury Collection Hotel in San Francisco, California. The iconic Palace Hotel has remained the landmark hotel in San Francisco with such timeless creations as The Garden Court’s stained glass dome and the 1909 Maxfield Parrish mural of “The Pied Piper of Hamlin” located in the Pied Piper Bar. The Palace Hotel is a full-service destination that offers elegant accommodations, esteemed restaurants and opulent spaces for meeting and special events. The Palace Hotel, San Francisco applies its exceptional standard of hospitality to every meeting, event and function held with us. This San Francisco hotel’s elaborate 53,000 square feet of meeting space is divided into 23 rooms – including 3 elegant ballrooms, 4 high-caliber boardrooms and, of course, the unrivalled Garden Court. From intimate business meetings to large scale presentations, the Palace Hotel will ensure your function is a resounding success. 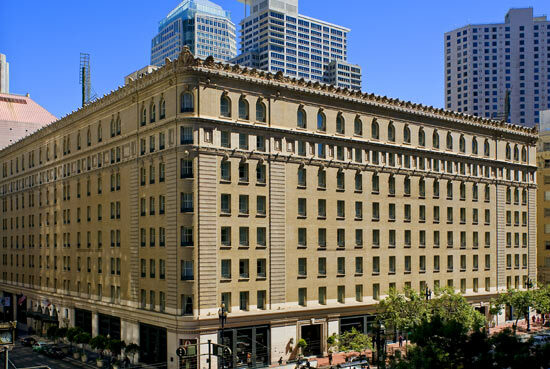 Located on New Montgomery Street in the heart of the San Francisco, just blocks away from Union Square, Chinatown, the Financial District and the Moscone Convention Center, the Palace Hotel is poised for convenience for the many things to do in San Francisco. A short drive or cable car ride away are Fisherman’s Wharf, the Golden Gate Bridge, AT&T Park and Golden Gate Park museums and attractions. Guests will experience hospitality on a grand scale in the 553 refined guest rooms and spacious suites, each appointed with elegant furnishings and contemporary amenities. Enjoy a leisurely dip or an invigorating swim in our heated, indoor swimming pool located on the fourth floor. An adjacent whirlpool and eucalyptus sauna further soothe and relax. Access to the swimming pool and fitness center is complimentary to Palace Hotel guests. We kindly ask that all children are supervised by an adult. Our fitness center includes cardiovascular machines (treadmills, elliptical machines and stationery bikes) with entertainment centers on each machine, free weights, yoga mats, and an exercise ball. Free weights range from 5 lbs. to 40 lbs. Pool and fitness center hours are from 5am to 10pm, Monday – Friday, and from 6am to 10pm on weekends. Pressed coffee is available outside the fitness center. The Palace Hotel has been the first choice for elegant San Francisco weddings for over a century. Offering the most distinguished service in an opulent setting, the Palace Hotel is a magical place to affirm your life together as a married couple. In addition to exquisite San Francisco wedding venues to choose from, the Palace Hotel offers full-service wedding planning assistance from invitations to flowers to catering and décor. Whether your dream wedding is an intimate gathering or the wedding reception of the year, our San Francisco wedding specialists will create an exquisite celebration that is an authentic reflection of you both as a couple. The Palace Hotel offers couples a wonderful variety of San Francisco wedding venues to choose from. Each of our San Francisco wedding locations features sophisticated décor and an elegant ambiance, perfect for ceremonies and wedding receptions. San Francisco’s only indoor historic landmark, The Garden Court is second to none. Its grandeur is unparalleled, with an intricately detailed glass domed ceiling and amazing accents at every turn. Located outside of the hotel’s main entrance, guests are immediately impacted by its charm and grace. Featuring capacity for 350 guests with a dance floor. One of the hotel’s most charming venues, the French Parlor has played host to heads of state and elegant San Francisco gatherings for decades. Split on two levels, the Upper Parlor is the perfect setting for sophisticated dining, while the Lower Parlor as an ideal location for wedding receptions and dancing. Antique glass window panes open to overlook the historic Garden Court. Two decorative fireplaces, stained glass ceiling and classic chandeliers provide a warm intimate feeling to the space. Capacity is up to 90 guests with a dance floor. Situated on the second floor, the Sunset Court offers the feeling of being outside without the risk of inclement weather. The beautiful domed ceiling showcases wonderful cityscape views of San Francisco. The graceful room serves up to 600 guests for wedding receptions with a seated dinner and dancing. The Ralston Room is a tribute to William Ralston’s prediction that the Palace Hotel would be the premier location for elegance and exceptional service. The luxurious Ralston Room features arched ceilings accented with gold, long French windows framed by intricate trellis work and ornate crystal lights. The Grand Ballroom offers a stunning 8,964-square-foot space with 18-foot ceilings, brilliant antique drop chandeliers, rich red and gold carpeting and elaborate crown molding. In its entirety, the Grand Ballroom can host 600 guests alongside a parquet dance floor. The Grand Ballroom can also be divided for smaller wedding receptions. The Gold Ballroom, touted as a favorite among high society groups in San Francisco, offers sweeping windows draped with lush fabrics and regal chandeliers. A decorative fireplace gives the space a feeling reminiscent of a classic parlor. Large mirrors above the fireplace complete the dramatic effect. Capacity is up to 250 guests with a dance floor. Contact our San Francisco wedding specialists for more information about our San Francisco Palace Hotel wedding packages. The beginning of your memorable wedding journey begins here at the iconic Palace Hotel – a luxurious San Francisco wedding hotel. Recognized among the finest luxury hotels in San Francisco, the Palace Hotel has been a retreat in worldly sophistication since its opening in 1909. Our exquisite San Francisco hotel suites and deluxe accommodations offer a wonderful blend of timeless elegance and contemporary amenities. The Palace Hotel features 553 accommodations comprising deluxe and superior hotel rooms, 30 one- and two-bedroom luxury suites, and the stately Ambassador Suite, Chancellor’s Suite, Governor’s Suite and Presidential Suite – each featuring the original fireplace as a showpiece in the room’s décor. All guest rooms and luxury suites at the Palace Hotel have 14′ ceilings and are beautifully appointed with traditional mahogany furnishings, modern fixtures, and contemporary lifestyle amenities including 37″ LCD flat screen TVs, web TV, Internet access, and private voicemail. The bathroom features a marble vanity, tiled flooring, hair dryer, magnifying mirror, telephone and Luxury Collection bath amenities. Complimentary bottled water is provided each day. Accommodations with views of Market Street below are available. The inviting décor of our 300-square-foot Superior Room is punctuated by rich mahogany furniture, juxtaposed to a gentle palette of soft creams and buttery yellows. Classic light fixtures provide the right mood for every moment, 14-foot high ceilings invoke an airy feeling, and wool pile carpets cover the floors in thick softness. The desk lamps feature electrical and telephone outlets in their base, providing for a convenient means of hooking up laptop computers and appliances. Further state-of-the-art details include a sleek 37″ flat screen television and dual phone lines. The bathroom is a study in luxury with marble countertops, lighted mirrors, gleaming chrome and brass fixtures, a combined shower and bathtub, separate telephone, a cozy bathrobe and a generous selection of the signature Luxury Collection bathroom amenity line. You have your choice of one king or two double beds topped with a soft down comforter, plump pillows and a luxe throw. Combining the best of both words, our Deluxe Rooms (330 square feet) feature an executive size mahogany desk paired with an adjustable ergonomic chair. Stay in touch both personally and professionally with High Speed Internet Access and a dual phone line. At the base of the tabletop lamps, ingenious multi-function outlets provide easy laptop and appliance connections. When it is time to unwind, a sleek 37″ flat screen television offers abundant entertainment options. Individually-controlled air conditioning and heating ensure your comfort year-around. Features such as 14-foot high ceilings and oversized windows contribute to the understated elegance. An inviting upholstered armchair and ottoman offer a comfortable reading and relaxing option. The bathroom is beautifully appointed with marble vanity, lighted mirrors, and gleaming chrome and brass fixtures. Our signature Luxury Collection bathroom amenity line of custom-blended soaps, shampoos, and moisturizers invites you to pamper yourself. Additional thoughtful details include a separate telephone, salon-style hair dryer and cozy terry cloth robe. At the end of the day, sink into a king or double-sized Luxury Collection bed covered in pure cotton bedding, a downy comforter and plump pillows. To underscore their lovely proportions, our 360-square-foot Grand Deluxe Rooms feature a large mahogany desk and armchair, and long graceful windows that allow natural light to stream in. Each room embraces charming architectural details such as 14-foot high ceilings and elegant crown molding on the walls – creating an elongated motif that complements the sweep of the damask drapes. A superlative 37″ flat screen television, dual phone lines, individually-controlled air conditioning and heating units, and ingenious tabletop lamps with multi-function outlets for easy laptop and appliance hookup add a sophisticated modern dimension to the old-world charm of the room. Thoughtful details in the spacious bathroom include our signature Luxury Collection bathroom amenity line of custom-blended soaps, lotions and shampoo, a lighted mirror, marble vanities, a combined shower and bathtub, a conveniently placed telephone and cozy terry cloth robe. Our king-size Luxury Collection bed promises a peaceful night’s rest with its down comforter, pure cotton bedding, plump pillows and cashmere-soft throw. Our 500-square-foot Suites are the perfect choice for guests who like to keep their work separate from the rest of their lives. The beautifully appointed living room functions as a well-equipped office, with a mahogany working desk, designated desk lamp, High Speed Internet Access and a dual-line telephone with personalized voicemail. The elegant tabletop lamps provide multiple outlets in their base for easy laptop and appliance hookup. In the graceful sitting area, a custom-upholstered sofa and plush armchair stand in front of a large mahogany armoire that houses a sleek 37″ flat screen television and JVC CD/DVD player. The airy bedroom, decorated in a soft palette of creams, blues and yellows, features a cozy armchair and a king-size bed or two double beds dressed in crisp cotton, a down comforter and plump feather pillows. Two full-length windows look out onto the vibrant cityscape of San Francisco. The sumptuous bathroom, complete with a combined shower and bathtub, sparkles with accents of polished chrome and brass. A large lighted mirror hangs over a creamy marble vanity, stocked with the signature Luxury Collection bathroom amenity line, a salon-style hair dryer and a separate telephone. Quiet air conditioning and heating units permit you to control the temperature of both rooms. The entire layout enjoys 14-foot high ceilings and refined crown molding that underscore the undeniable architectural grace of the hotel. 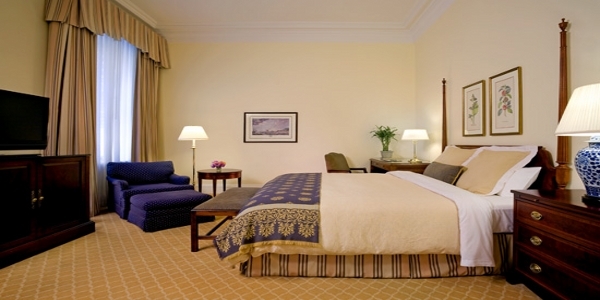 All of our Suites with king beds may be connected to a second bedroom with two double beds, for an additional charge. The Palace Hotel perfects the art of dining with three distinctive San Francisco downtown restaurants: Garden Court, Kyo-ya, and the Pied Piper Bar & Grill. Led by the esteemed Executive Chef Jesse Llapitan, each of our delectable San Francisco restaurants is highly regarded for ambiance, service and mouthwatering cuisine, whether the calling is sushi, brunch, a romantic dinner or an executive power lunch. The only indoor historic landmark in San Francisco, the Garden Court restaurant debuted in 1909 and has been the remarkable setting for family gatherings, lavish parties, high tea, dinner dances and much more. The Garden Court today serves an extensive breakfast and lunch menu, Saturday afternoon tea, and an extravagant San Francisco brunch on Sundays. The restaurant is also available for private parties. Open daily. Breakfast: Monday – Friday: 6:30 a.m. to 10:30 a.m., Saturday: 6:30 a.m. to 11:00 a.m. , Sunday: 7:00 a.m. to 10:00 a.m. Lunch: Monday – Saturday: 11:30 a.m. to 2:00 p.m.
Sunday Brunch: 10:30 a.m. to 1:30 p.m.
Saturday Afternoon Tea: Reservations begin at 1:00 p.m. Extended holiday hours offered seasonally. Savor the mouthwatering flavors of traditional Japanese cuisine at our award-winning Kyo-ya restaurant. 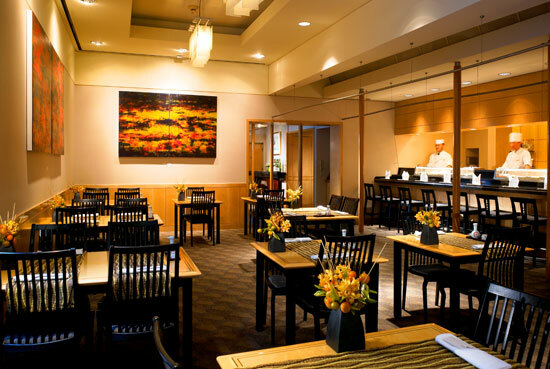 More than a San Francisco sushi restaurant, Kyo-ya is recognized as San Francisco’s premier Japanese restaurant. Kyo-ya is led by dynamic duo of star chefs who have earned the restaurant rave reviews from the likes of Gourmet, San Francisco Magazine and the San Francisco Chronicle. Kyo-ya is open Monday – Friday for lunch and dinner. Lunch: Monday – Friday: 11:30 a.m. – 2:00 p.m. Happy Hour: Monday – Friday: 5:00 p.m. – 7:00 p.m.
Bar Dining: Monday – Friday: 5:00 p.m. – 10:00 p.m.
Dinner: Monday – Friday: 6:00 p.m. – 10:00 p.m.
Open Daily for Lunch and Dinner: Monday – Friday: 11:30 a.m. to 12:00 a.m., Saturday: 11:00 a.m. to 12:00 a.m., Sunday: 10:00 a.m. to 12:00 a.m.
A San Francisco tradition for decades, Sunday brunch at the Palace Hotel is truly an unforgettable experience. Enjoy a decadent brunch with live musical entertainment in one of the world’s most beautiful dining rooms – The Garden Court. Seated beneath a glass dome ceiling adorned with shimmering Austrian crystal chandeliers and surrounded by soaring marble columns, The Garden Court is the perfect setting for an elegant Sunday brunch. The Palace culinary team prepares a buffet brunch that offers something for everyone. Our chefs create a selection of made to order crepes and omelets, breakfast breads and pastries, salads, sushi, dim sum, seasonal California cuisine and of course – sweet dessert temptations. Check out the Sunday Brunch Menu. The Palace award winning Sunday brunch in The Garden Court is recognized as the top brunch spot in San Francisco. Served Sundays from 10:30am to 1:30pm. Reservations are essential. Please call 415-546-5089 to make your arrangements. Experience the elegance and tradition of afternoon tea in San Francisco at the historic Palace Hotel. Enjoy afternoon tea in our Garden Court – one of the most beautiful settings for dining and holiday events in San Francisco. Since the early 1900’s, guests have been enjoying elegant tea service in our Garden Court – where families and friends have enjoyed this magical experience. Immerse yourself in the romance and charm of our turn-of-the century grandeur and heritage. Fine china and silver service present delicate tea sandwiches, homemade scones, Devonshire cream, lemon curd and rose petal jam. Relax and sip a variety of teas – from classic blends to creative infusions. For special San Francisco events, sparkling wine tea is the perfect way to celebrate. Prince and princess tea features whimsical presentations with a crown and candy scepter to make your child feel like royalty. Whether you are our hosting a bridal shower, a holiday celebration, engagement party or would simply just like to enjoy the tradition of tea at the Palace Hotel, Afternoon Tea is a wonderful San Francisco experience. Afternoon Tea is served on Saturdays starting at 1:00 p.m., as well as special days during the holiday season. For reservations, please call 415-546-5089.